6 months of magic and mayhem…with more to follow! Today’s post is a rather reflective one, so apologies for getting a little misty-eyed and overawed! 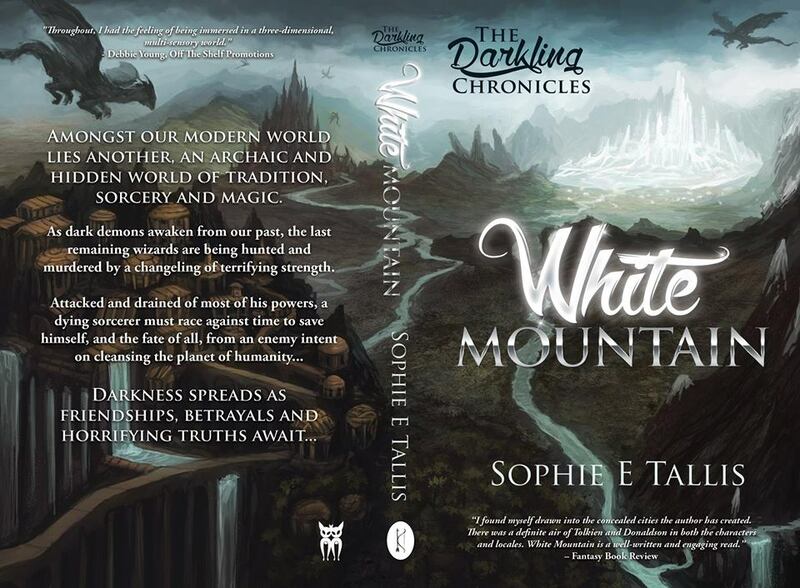 Six months ago on the 1st December 2014 my debut novel, White Mountain, the first of my Darkling Chronicles trilogy, was gloriously published by Grimbold Books & their imprint Kristell Ink Publishing. I knew at the time that the merry-go-round of madness was about to begin, but boy what a rollercoaster ride it’s been! White Mountain, as most of my friends, family and supporters know, was a complete labour of love that took over ten years to write, research and worldbuild (yes, I am a VERY slow writer! I promise that Book 2 WILL be finished and ready next year, so no decade to wait!). 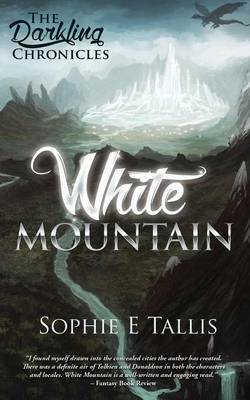 All my interests in ancient history, world mythology, geography, geology, natural history, ecology, anthropology etc., etc., dripped into the history and worldbuilding behind the story of White Mountain; and my personal experiences and complicated relationships seeped into the characters and their lives. No matter what genre you write in, no matter how fantastical or other-worldly it may be, use your life in what you write. For me it was a wonderful cathartic experience of writing about dysfunctional relationships I knew, about friendships, inner turmoil, feelings of atonement, guilt, rage, loneliness and yes, it was liberating to write my villain, a thoroughly nasty, manipulative, violent and cruel character who I have openly admitted is based on my father. Do I have baggage to write about? Hell, yes…don’t we all? Anyway, White Mountain was born into the world with its awesome new cover and that’s when all the fun began! The last six months has been a manic ride. 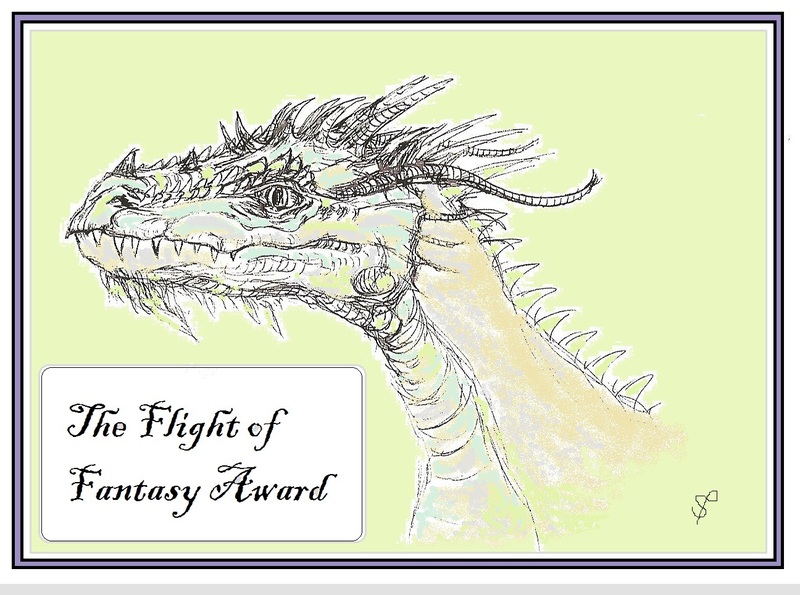 I attended my very first fantasy/sci-fi convention, BristolCon, (huge thanks to the multi-talented and fellow fantasy writer, Joanne Hall who founded & runs it brilliantly). 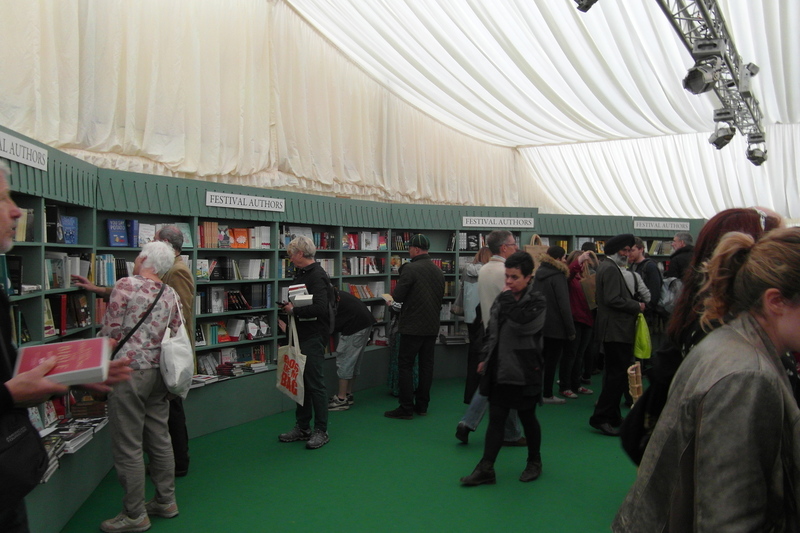 I went to my first book fair and did my first public reading (terrifying but brilliant!). 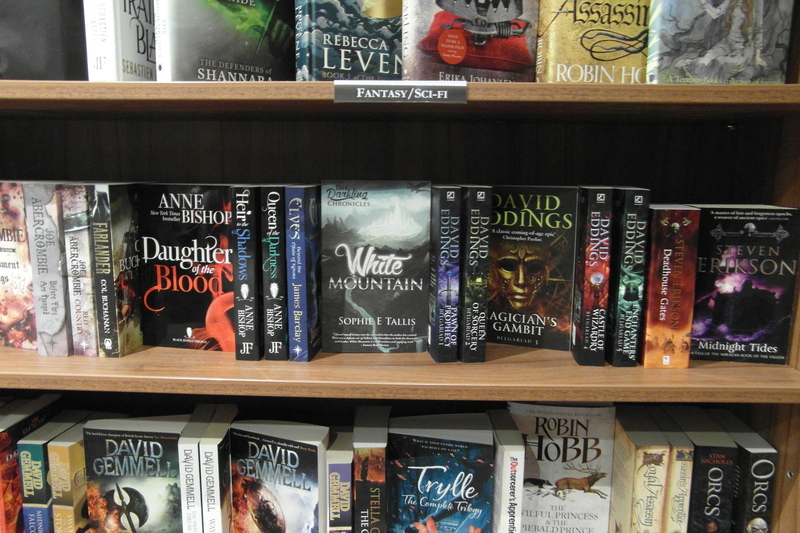 I then embarked on a hectic book-signing tour around Wales and the West Country, signing in some truly gorgeous and prestigious bookshops and meeting some terrifically awesome people along the way. Best of all though, has to be that sense of tingling excitement when someone buys your book! I don’t think I’ll ever feel blasé about that, it’s a truly humbling experience chatting to customers, signing and dedicating books to them and loved ones. Simply put, it’s just one of the most magical experiences and completely eclipses the awkwardness and embarrassment of sitting in a bookshop feeling like a lemon waiting to be squeezed! Amongst the book-signing tour and newspaper articles I went to my first literary festival as an author, to do a poetry and fiction reading. The tiny but potent, Hawkesbury Upton (HULit) Literary Festival, founded by local indie author, Debbie Young, who is a one-woman self-publishing whizz and who managed to not only organise the whole event but to even attract big name authors such as Katie Fforde – who opened the event, read from her book and graciously took a photo op with little old me! White Mountain, continued to pick up momentum and great reviews, including gaining a 5 star review and shiny medal from Reader’s Favorite and from very popular websites, Girl Who Reads and Brainfluff among others. Of course we authors are always desperate for more reviews as we know that getting reviews is absolutely crucial to whether a book succeeds or fails. So if you read a book you love, help that book and author and post a review! Then, amongst the book signings and readings, I was asked to participate in the Cirencester Literary Festival in July, as an author and illustrator and run my own illustration workshop for children in Bingham Gallery! With more bookshop signings and book fairs on the horizon in addition to BristolCon 2015 and FantasyCon coming up in the Autumn, it has been a gloriously nutty few months! Then…to top it all off, White Mountain, has been shortlisted in The People’s Book Prize! The People’s Book Prize is the only major literary award voted by the people, as a way of finding new books and new talent which may have been overlooked by mainstream markets. 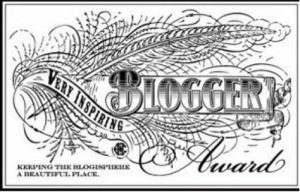 Founded by Dame Beryl Bainbridge and with Frederick Forsythe as it’s current Patron, it is wonderful to be nominated. Do I have a chance of winning? I’d certainly LOVE to win as it’s a fantastic way of raising your book’s profile, with the awards ceremony even being televised on SKY News, but honestly I don’t hold out much hope. White Mountain is in the Children’s category and the competition is very stiff with the most likely winner being a larger mainstream author who sells in Waterstones, has a larger fanbase and has won it before. BUT, you never know…could David defeat Goliath? Great days are made of Hay! 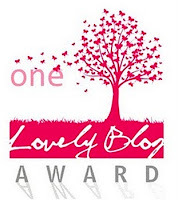 Firstly, apologies for the length of this blog post…but I had so much to share…! 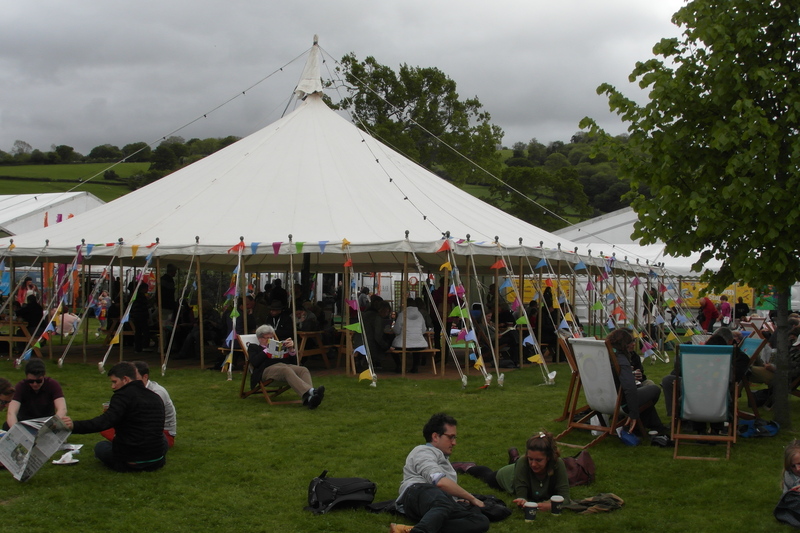 On Sunday 24th May I had the great fortune to visit my beloved Hay-on-Wye again, nestled deep in the Welsh and Herefordshire countryside (it straddles the border between England & Wales), for their world-famous literary festival, The Hay Festival. It was a truly wonderful and exhausting day, tinged with great delights and just a little bittersweet sorrow. 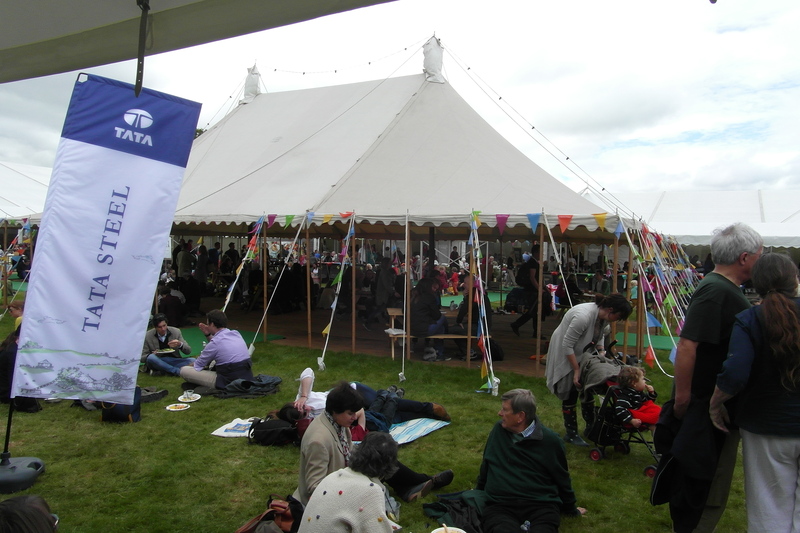 For it was almost exactly three years ago that I last visited the Hay Festival, as I did on Sunday, with my good friend and fellow fantasy writer, Will Macmillan Jones, and it was on this occasion, three years ago, that we saw the wonderful Sir Terry Pratchett on what turned out to be his very last appearance at Hay and one if not the, last public appearance before his untimely and sad passing earlier this year. 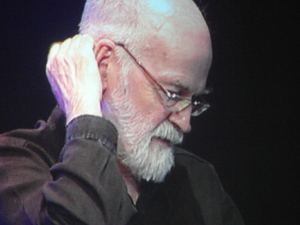 I remember the event well, Will being a truly gifted comic fantasy writer akin in many ways to Terry Pratchett, his hero, was particularly excited to see the great man as was I. Sir Terry was witty, erudite, bracingly honest and, quite understandably given the nature of his condition and imminent demise, more than a little wistful and reflective. We noted that trademark and cutting sense of humour which was so prevalent in his work, but was now tinged with a grimness, a reality of the brevity of life perhaps. And so, coming back to Hay for the first time since that auspicious visit, brought the enormity of losing such a literary giant into clear focus. He was a man of many talents and his legacy will outlive us all. 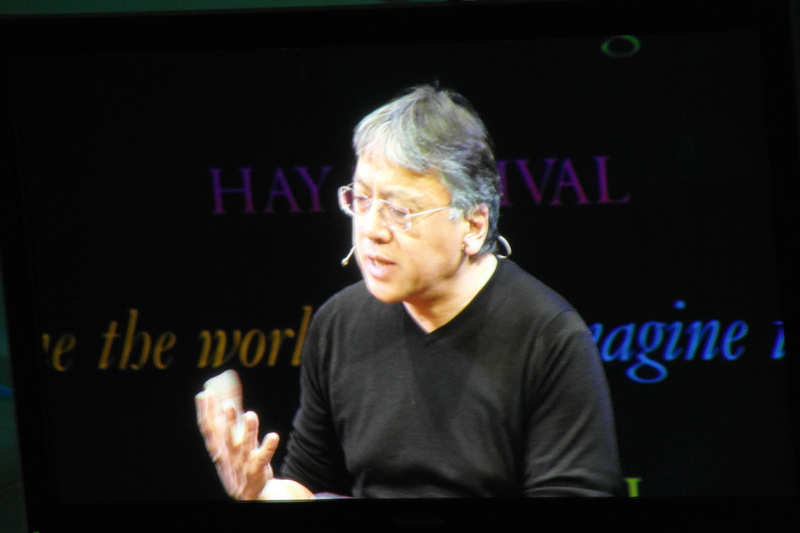 For this year’s visit, despite the sad memories of three years ago, I was very excited to see one of my favourite writers, Kazuo Ishiguro. I had read ‘Remains of the Day’ and ‘Never Let Me Go’, some time ago, and yes, saw the ubiquitous movies, and loved them. I was not to be disappointed. 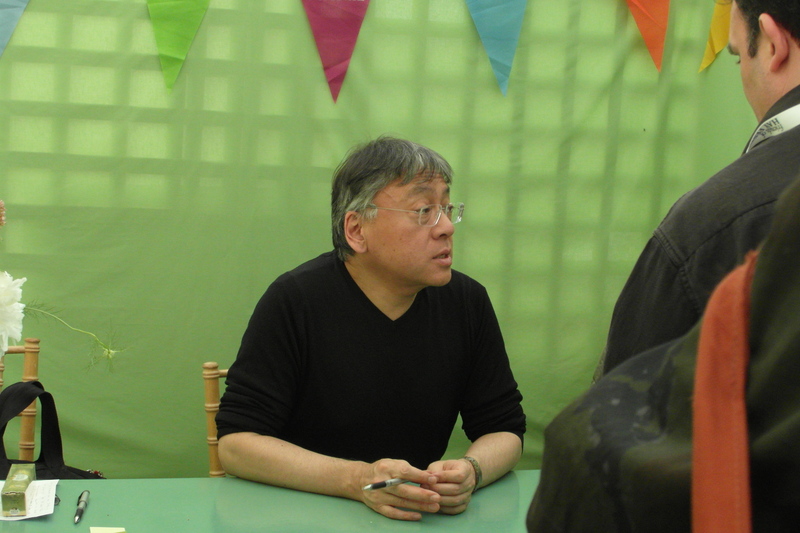 Kazuo Ishiguro proved to not only be an extraordinarily talented writer, but a genuinely lovely human being. Honest, warm, and completely open, he seemed amazed and genuinely humbled by his own success and quite baffled about how he has arrived where he has. Not a hint of complacency or arrogance. 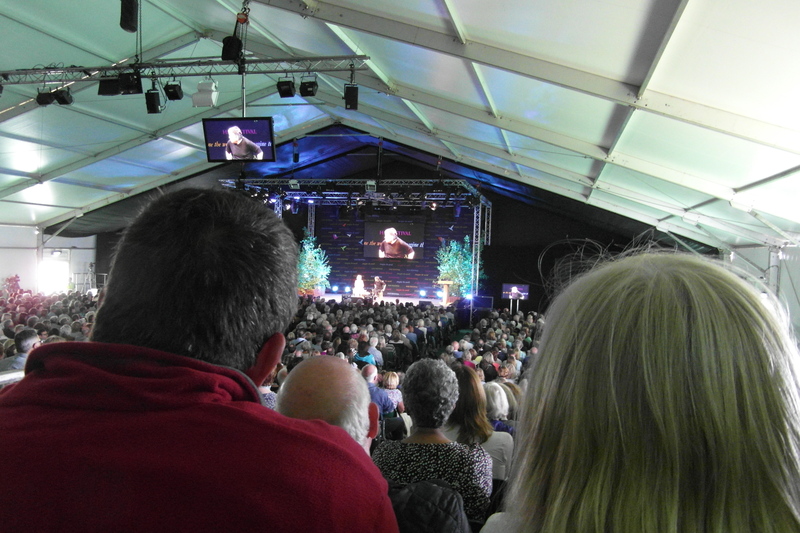 He spoke in the main Tata Tent on stage to TV & radio presenter, Martha Kearney, a woman I knew well from various arts programmes and the whole conversation was televised. I was pleased to be sitting at the back behind the whirling TV cameras, and despite being so far away from the stage, we had a great view! 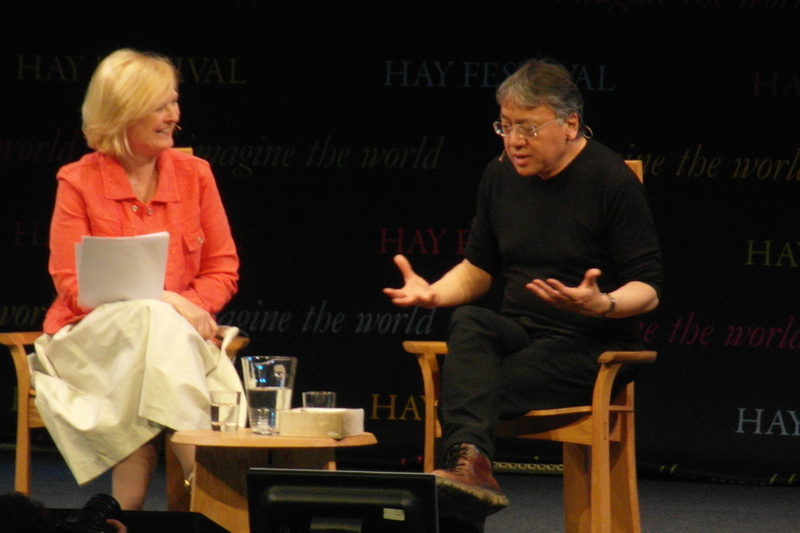 Kazuo Ishiguro spoke about his newest book, ‘The Buried Giant’, and the elements which permeate his work, the quietness, stillness with emotions bubbling under the surface, which is the trademark of his writing. He spoke about things unsaid, how we all have such buried giants in our lives, and whether we should speak about such experiences openly, good and bad, or self-censor ourselves, a kind of collective amnesia to allow us to continue in our daily lives rather than be caught up in the pains of the past. Should we remember everything regardless of the consequences? It’s a powerful notion. After all, although ‘The Buried Giant’ is not an overtly allegorical tale, none the less, the author spoke about conflicts such as the Rwandan Genocide and the Yugoslavian War, where neighbours had lived in relative peace despite their religious or cultural differences for years until suddenly a catalyst, a memory, an event had sparked hostility long harboured but buried, and the outcome of that Buried Giant was the slaughter of thousands and the disintegration of the country. Is it good to remember or better to forget? Interesting notions to be sure. I found myself conflicted over it. Certainly I have witnessed and been a part of a very traumatic past, full of personal tragedies and barbarity, things that scar, things that are best forgotten in order to try to move on and form some semblance of a future, of a future happiness. Churning up such painful memories for me, are not entirely helpful. I lived those events that made me who I am, I survived them and talked about them infinitum afterwards, but at some point a form of amnesia is helpful, a means of wiping the slate clean and starting again. In my case, new home, new location, new name. 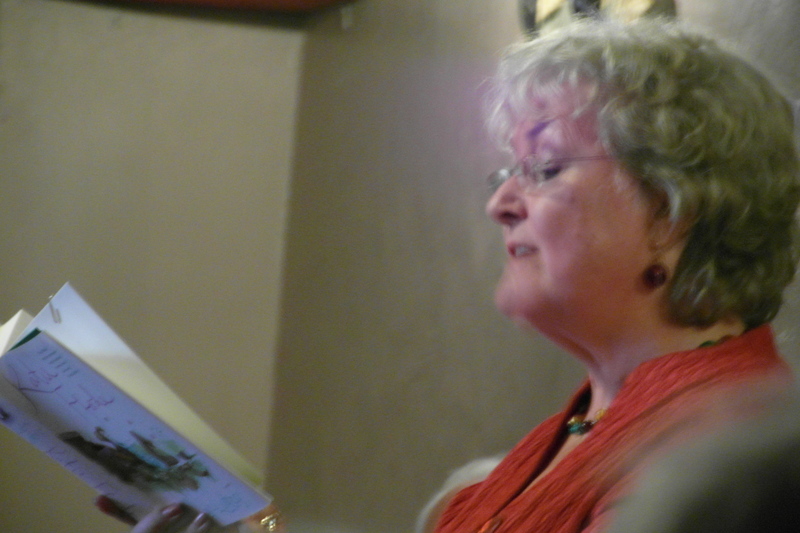 But certainly I found it a mesmeric and remarkably personal talk. 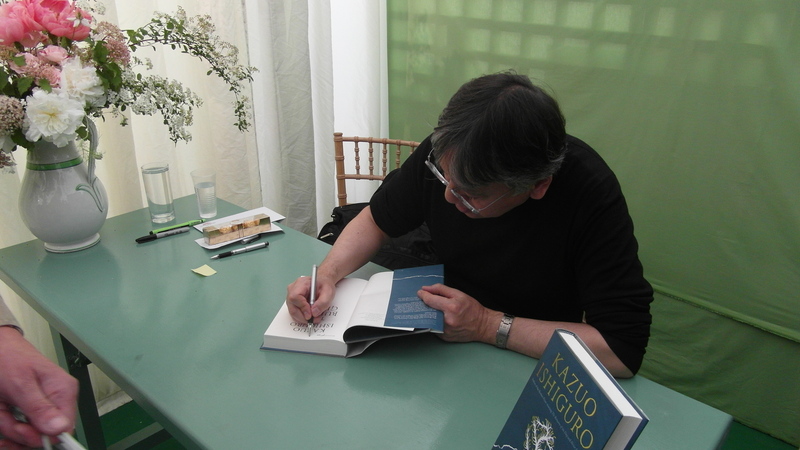 Another of Kazuo’s wonderful observations and one which most of my fellow fantasy writers will wearily nod their heads in agreement at, was the acute prejudice Kazuo Ishiguro faced when he told people that his next novel was going to be a fantasy book! He injected the conversation with humour, saying how unprepared he had been for the sheer level of prejudice he found against ogres. He talked about the inherent dangers in people being pigeon-holed into only writing in a certain genre, and how freeing it was and necessary to cross those invisible genre boundaries. Quite rightly, he talked about how people took the ‘rules’ of their chosen genre far too seriously and that he didn’t want to adhere to any restrictive and creative constrictive rules. Good for him! Yes, I see myself as primarily a fantasy writer, but I also write sci-fi, literary, children’s and poetry, and I hate some of the rigid made up ‘rules’ which others always want to adhere to those of us who write in those genres. I love the freedom of Ishiguro, that he defies such constrictions and instead writes about themes which inspire him, whether it falls into the category of literary, historical or sci-fi fiction. These genre boundaries are primarily there for marketing purposes by publishers after all. It was refreshing and enlightening to hear. But yes, myself and Will certainly pricked our ears up when Kazuo described the snobbery and prejudice against the fantasy genre, as of course, most fantasy writers have experienced this, how somehow the fantasy genre is frowned upon as being a lesser form of writing than crime, sci-fi, historical etc., that somehow it is only the domain of the childish and illiterate. After the event, Will and I raced to the festival bookshop to meet Kazuo in person. While he was graciously signing my books, I asked him the question again and he elaborated, that yes, he had been hugely taken aback by the level of prejudice in the book industry against the fantasy genre and fantasy writers, that so many people had been surprised by his wanting to write in that genre! In fact, Kazuo went on to say that he was actually writing a newspaper article about it along with a prominent fantasy writer! SO great to have a light shone on this subject at last. Great writing is great writing, regardless of genre! Lol, anyway, I digress. It was fantastic meeting Kazuo and being able to chat to him for a little while, a real gentleman and such a genuinely lovely person. I marvel at his talent, and certainly hope to achieve even a little of his quality and success in my own writing. 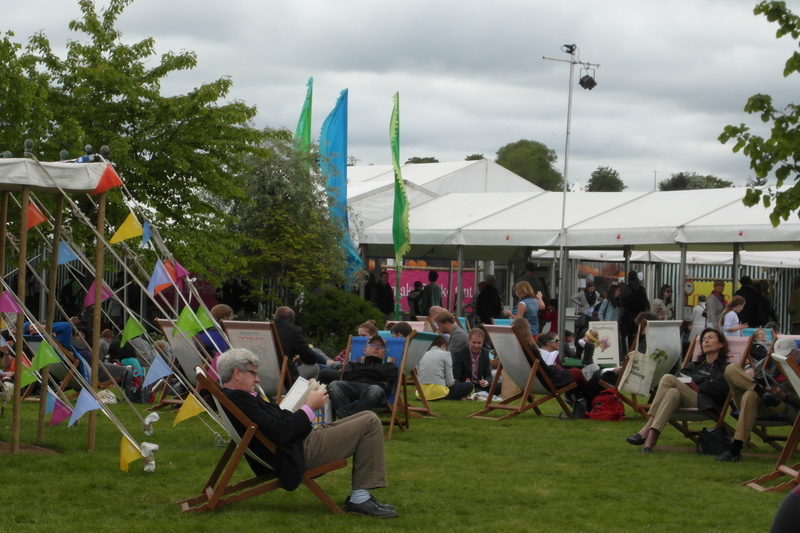 After our fabulous Kazuo Ishiguro event, we continued to wander around the Hay Festival. So many events going on, the whole place was buzzing. 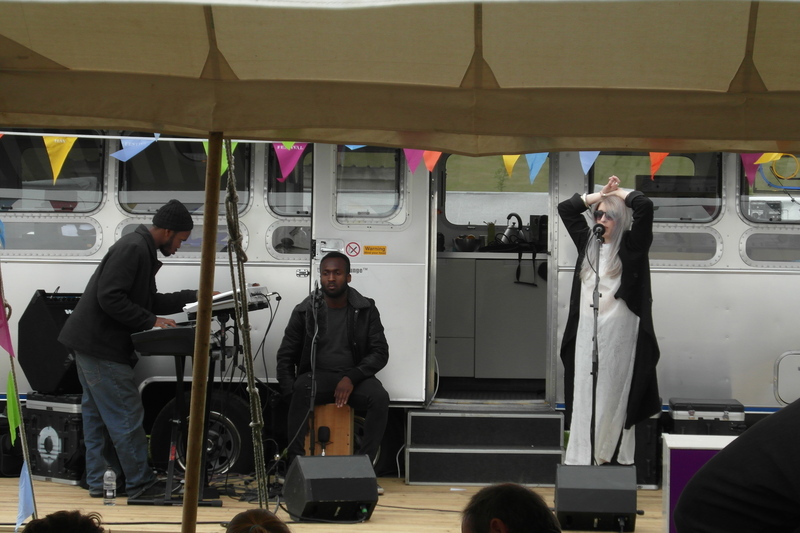 Musicians on tom-tom drums, Romany caravans, fluttering flags that gave the whole place a Tibetan feel, bohemian artists around every corner and to suit every taste, from street art to posh galleries, children events to the most intellectual fair. A heady mix of art & culture under canopies of white. The sky threatened rain, but the rains held off and in dazzling moments of perfect sunshine, I defy anyone not to think they had risen to Elysium! 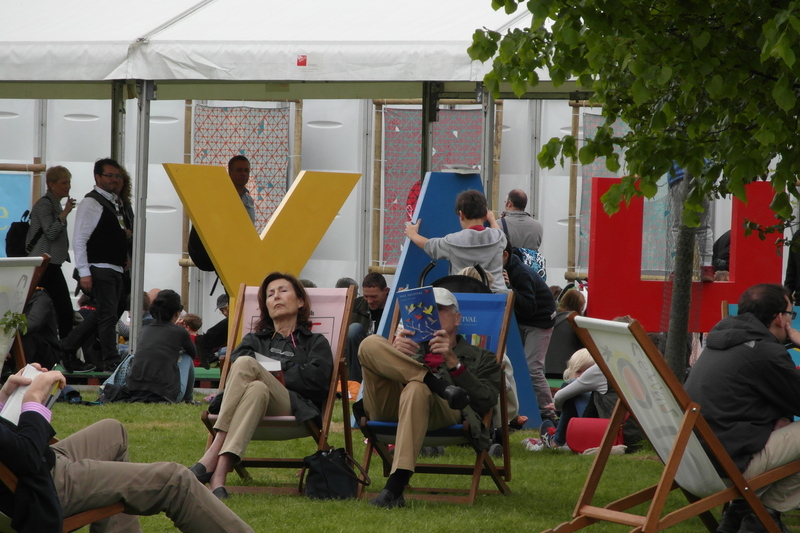 Just before we left, to take the shuttle bus into the town itself and ensconce ourselves in their beautiful bookshops, I took a photo which for me perfectly encapsulated the Hay Festival experience – a woman fast asleep in a deck chair in the blustery sunshine, surrounded by bibliophiles of every age, total heady exhaustion! 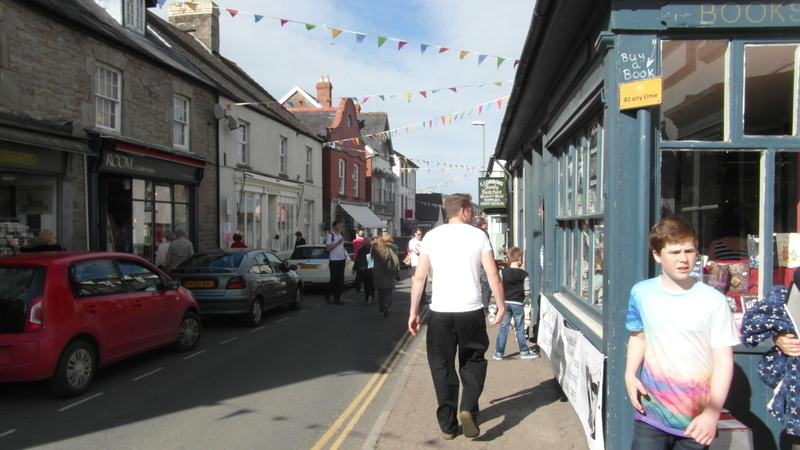 We headed into Hay-on-Wye. The first sight was a little dismaying though, for amongst the plethora of bookshops which over the years I have visited so many times, there were noticeable gaps. Yes, even in a book heaven and haven like Hay, at least two bookshops had closed, replaced by clothes and odds & ends shops. 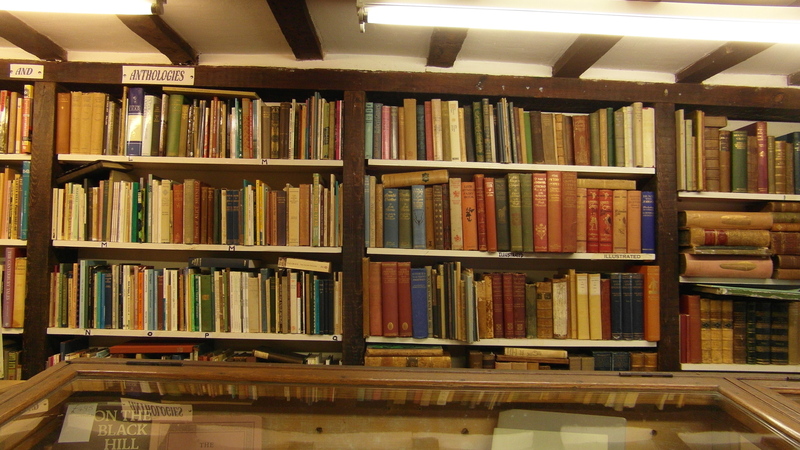 We’ve all heard the disturbing news of bookshops closing around the country, but to have at least two (I suspect three) independent and antiquarian bookshops close in Hay-on-Wye of all places, filled me with dread. I ask all of my friends out there, by all means by your kindle editions from Amazon, but please, PLEASE support your local independent bookshop! If you don’t support your local bookshop, frankly, it may not be there for many more years and what a poorer world we would have as a result! 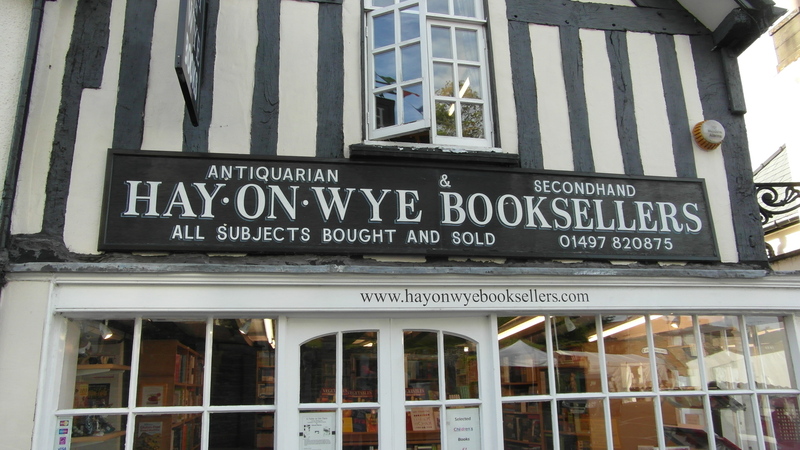 We wandered in and out of the bookshops, the posh expensive one, the cheap as chips one, the Hay castle one (on a wonderful honesty basis), and my favourite, The Hay-on-Wye Booksellers! Yes, I totally blew my book budget and bought loads! I couldn’t help it. Although my feet were aching with a dull persistence, the nooks and crannies of this shop held me in sway, around every corner was a little gem, a little undiscovered beauty…ah! I wish you could see and smell the pages, the leather bindings, gold leaved embossing, the parchments, the buckram coverings, the slightly imperfect spines, the whole experience….sheer book bliss! 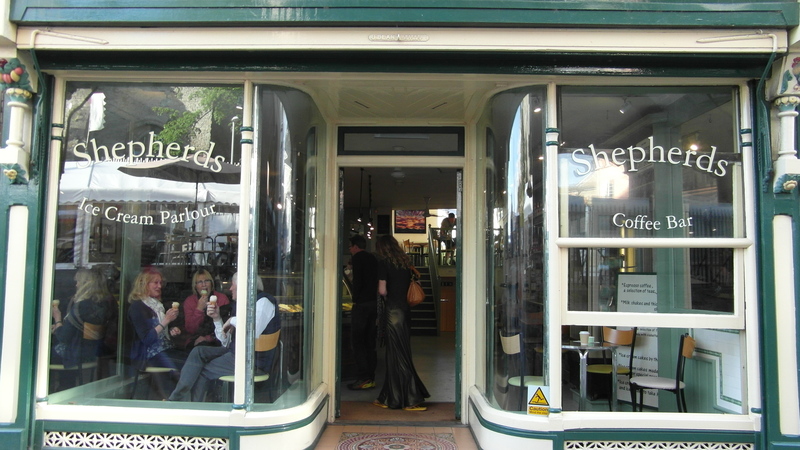 What a thoroughly lovely day….I must mention that we popped into Shepherds, the most gorgeous ice-cream parlour, something straight out of a Neapolitan street, all rounded art deco glass front, high lacquered countertops and mosaic tiled floors, with the scent of espresso in the air! It was, without doubt, the best ice-cream I have ever tasted outside of Italy itself, only later did I find out that this family firm was venerated by many others (besides my taste-buds) and made their delicious ice-creams from sheep’s milk! Wow and yummy! All in all, it was one of those magical days that come along so seldom. Great company and great culture colliding into one utopian day that left me utterly exhausted but on a high all the way home. Thank you, Hay, I SHALL be seeing you again, very soon! 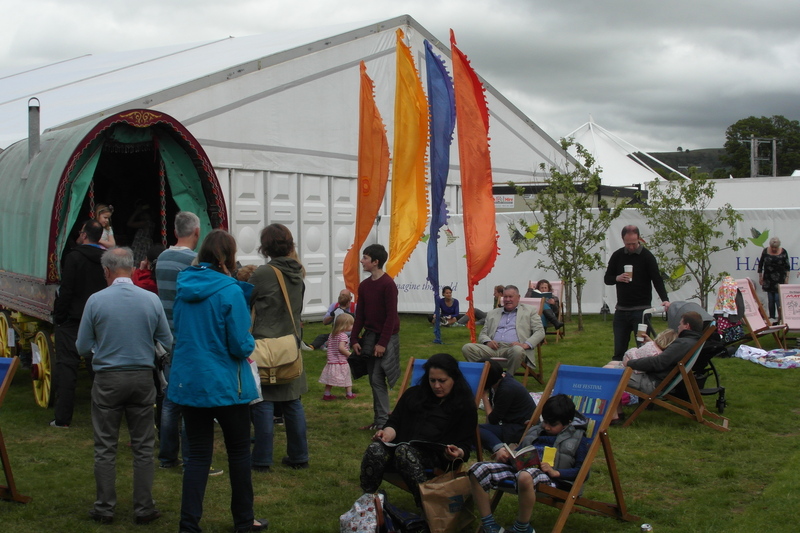 Next year, I have my sights on the wonderfully talented, Neil Gaiman (appearing at Hay this Friday 29th May).